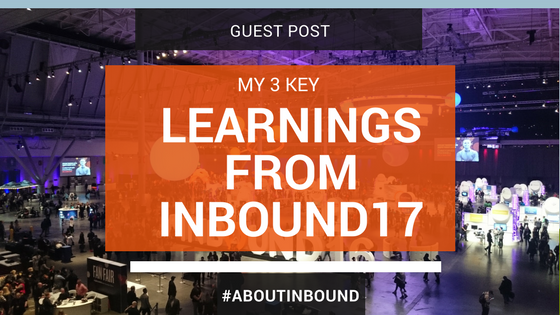 It has been just over one week since I got back from Inbound 17 in Boston's Convention and Exhibition Center (BCEC). The marketing and sales event organised by HubSpot which saw over 21 thousand marketing and sales professionals descend on the BCEC over a four day period. During this time they listened, learned and left with some inspiration to take on any challenges that lay ahead of them. Now that all the dust has settled and I have had a chance to reflect on everything I wanted to write this article to pass on the key learnings that I took away from it. This was especially true when I listened to Michelle Obama talking on the main stage at Inbound. It was amazing to hear someone of her stature who is so well respected to be able to talk straight and connect with such a large crowd. Even though there was thousands (and I mean thousands) of people beside me in the room it really felt like you could have been having the same conversation in her living room or at the kitchen table. Her honesty and courage to stay true to herself was highlighted as she referred to herself numerous times as "a kid who grew up on the Southside of Chicago", never forgetting where she came from or who she is. I spoke with a lot of people after her keynote, some queued up before 6am to get in and see her, the one thing they all mentioned to me was how genuine she came across on stage. What is evident here is that if you stay true to your real self and do not pretend to be something you're not then your message is pure and consistent, add some passion to this and it is captivating to watch. This is something that I have noticed across many different areas of business and sport over the last few years. Just looking at personalities like Gary Vaynerchuk and Conor McGregor who have rapidly rose through their respective ranks and gained global attention and success along the way. Although their styles may be seen as controversial you cannot deny that they have the courage to open up and show their true self every time they communicate. Even as a kid I remember being told "a good liar needs a great memory" and I think that is something that businesses and professionals can really take from. I recently watched a Gary V video where he spoke about this specifically and highlighted how much harder it is if you are putting on a different 'mask' when the cameras are on. I think this courage is something that all professionals and businesses can learn from and needed in order for people to connect with them and to gain loyal followers. If there is one thing that I have learned from consulting with hundreds of businesses it is that good products do not equal great businesses. This was one of the first things that I learned in HubSpot when I joined nearly 3 years ago. I quickly noticed that there was just as much emphasis on what was happening outside of the product as there was within it. In particular, the culture of the company and how important it is to maintain an open and collaborative environment. This may sound pretty simplistic to some but in many companies today this is sadly forgotten. Amongst all the content that HubSpot has published over the years, one particular piece that really seems to have resonated with the public is the culture code. It has over 3.4 millions views and growing everyday, it has not only helped the business grow while maintaining the startup like environment, it's principals have also been adopted by many other companies. You see in this day and age it requires much more than a good product to be a cut above the rest of your competition. You need to have an overall vision and great people on board that are all aligned and pushing in the same direction. This is what HubSpot's co-founder Dharmesh Shah referred to as "aligned vectors" during his keynote on the main stage at Inbound this year. When I heard this it sent alarm bells off in my head reminding me of some of the companies which I have worked with and didn't reach their full potential. It was quite simple when I thought about it, if you have a good product but lack the people to execute on a day to day you will not achieve the potential results. The same way if you have good people but only an average product you will eventually hit a ceiling when trying to scale your business. The best combination is to have a good product and good people who fundamentally understand what they need to do and know how to do it. This highlights the need for businesses need to have a solid vision which everyone can get on board with and help drive towards it. In HubSpot this comes in the form of our MSPOT that is driven by our executive leadership team. It is something that allows HubSpot and it's employees to focus and ensure alignment throughout all departments. So whether you're a start up business or one that has been running for years this is definitely a framework in which I would be using moving forward. This last key learning came from an unlikely source, the keynote speech of WWE Superstar John Cena that was delivered on the last day of the Inbound conference. Now although my wrestling fan days are long behind me I was still interested to see what John Cena was going to bring to the stage and how he would connect with the crowd. To my surprise one of the first things he done was to address that this was a strange scenario for him and that he would not be the 'typical' fit for such an event. He explained that although he could not tell marketing and sales professionals how to do their job he could share some insights into what has made him so successful. He told us that his role as a wrestler is to be an entertainer and storyteller, which meant that he needed to have a deep understanding of his audience and market. One particular story he shared with us was how he identified China as an opportunity for the WWE Corporation. He explained that as the shows were conducted in English the Chinese fans did not fully understand the concept and when they found out that parts were faked or staged they would feel conned. So in light of this John made it his goal to learn the Chinese language so that he could speak to this market in their native tongue and connect better. He then demonstrated some of his language skills live on stage just in case anybody thought he was just telling a good story. He also explained that the WWE now has a program in place where any wrestler can learn a language off the back of this. To me this shows that having a fundamental understanding in what your role is along with knowing what your company does allows you to see the trees from the forest. It can allow you to focus on moving in one direction without any distractions slowing you down. An honours marketing graduate with a background in large-scale SEM, Social Media and Marketing Communications. Now a Senior Inbound Marketing Consultant with Hubspot, helping businesses improve their lead generation and growing their customer base with the world’s leading inbound marketing and sales platform.